Auto-Tweets, Are they bad for business? New updates, improvements and automations are announced daily regarding social media networks and their relationships with each other. Most seem to be a huge blessing, a much needed improvement that has arrived to make your life easier. Set them up and you’ll be on the fast track to growing your business with a lot less effort on your part, or will you? The question at hand…Should you rush in to automating tweets? I think it’s important to truly understand the purpose of Twitter, how it can work for you, and how it can work against you. The most benefits to be had are gained by making connections, not just spamming as many followers as you possibly can. Connections are made by actually “connecting” with others. What do I mean exactly when I say connecting? I mean being present, reading your followers tweets, commenting back, re-tweeting when they ask, when you see a tweet worthy of sharing with others, or when you want to help another blogger or business owner out by sharing their link, etc. When I say “present” I don’t mean that you have to be on twitter 24/7 in order to read and respond to everything, I mean checking your twitter acct just as you would your phone’s voicemail or your email. Why is this important? Well after FaceBoook gave you the ability to autotweet your facebook status updates or fan page posts, people who had a twitter acct but rarely used it, they just became a whole lot more active on twitter! The problem…They aren’t actually on twitter. Imagine this, you ask your facebook fans “I’m bored, what should I do?” or you ask “Do you have any suggestions for my website or ideas for future blog posts?” You wait, you see comments on your FB Page and you respond. But what about twitter? I bet you forgot that those same questions are being asked, pretty much broadcast, to all your twitter followers as well. They don’t know that you’ve asked it on FaceBook, they think you’ve asked them, on twitter. So they respond, maybe out of courtesy or perhaps out of genuine interest, they may even be a past, present or future customer of yours. Sometimes they respond with a question, sometimes just with an idea or comment that you’d normally respond to with a “thank you.” But you know what? They’re talking to you and you aren’t listening. So, wrapping this up… I am not saying auto-tweets aren’t convenient and can’t work to your advantage, but I am saying that you should realize that you might be “accidentally” engaging customers and followers in a seemingly one-sided conversation on Twitter. Let this article serve as your friendly reminder, check your twitter account regularly and make sure that you are diligently responding to your replies and messages. I hope you found this post informative! Let me know if you have any questions or comments. TweetChat Tutorial: How to participate in a Twitter Chat or Twitter Party. Each week I have the privilege of getting to participate in weekly #clothdiapers chats on twitter and each week I post reminder’s that “It’s Monday night! Time for the #clothdiapers chat!” So many of you are able to participate and so many of you want to but just don’t know how. Recently I made a Youtube Video/Slideshow explaining how to use TweetChat to participate in a Twitter Party or Twitter Chat but since not everyone can watch videos I figured I’d do a photo tutorial/explanation as well. First thing you’ll do (assuming you have a Twitter acct) is go to Tweetchat.com. Next, you will log in to your Twitter Acct through TweetChat. You do not have to sign up for anything and they do not have access to your password. You sign in and grant access. After you’re logged in to your Twitter Acct via TweetChat you will have the chance to enter your #hashtag in the box at the top of the screen. The Hashtag is going to filter out every other thing on twitter and only show you tweets that have that same attached hashtag. For the purpose of this tutorial I used the #clothdiapers hashtag. For Twitter parties you’ll want to use the designated hashtag for that party. After entering the #clothdiapers Hashtag you’ll see the most recent posts using that hashtag as well as any live tweets using it, in real time. Now when you type a tweet it, TweetChat will automatically attach the hashtag that you specified to it. You will then see your Tweets appearing in the list of tweets before you. If the tweets are moving too fast for you to keep up then you can adjust your refresh speed as seen in the photo above. Lastly, you should know that you can “star” important tweets so that you can go back and respond later. Or in the event someone shared a link that you want to check out, etc you will easily be able to find them. Next to the “star” you will also see a way to respond/reply to a person’s tweet or to “retweet” a tweet that you like. These are the basics of participating in a Twitter Chat or Twitter Party. If you plan on attending a Twitter Party and never have before then I suggest you try a couple Twitter Chats first. Cloth Diaper Twitter Chats are Monday nights, every week, at 9:00pm eastern. Have any questions? Feel free to contact me by commenting here or on my FaceBook Page. I hope to see you on Twitter soon! 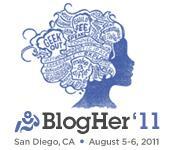 The Cloth Diaper Geek & She Thinks Media are looking for BlogHer Sponsors! Hello! Thank you for reading beyond the first sentence! Perhaps you’re interested in finding out more about what’s involved in sponsoring the Cloth Diaper Geek and She Thinks Media? That’s great! I’m offering different sponsorship opportunities to suit different businesses needs. I’m a social media and marketing professional, freelance writer/blog contributor for many blogs, and overall online social butterfly (on behalf of my clients). I’m not asking that you simply sponsor for fun or just because you can, I’m asking that you sponsor me and let me earn my way to BlogHer by allowing me to work for your company in various ways through the end of the year. Platinum Sponsorship (You receive the following through Dec 31, 2011) $200.00 *limited number of Platinum Sponsors available. 2 posts per month (which I will write unless you want to provide them) on my blog (www.clothdiapergeek.com) about anything you like. Posts could promote a specific sale, your store in general, a giveaway, etc. These posts will also be cross promoted on my FaceBook Page and Twitter. If you prefer I could contribute 2 posts per month to you for use on your blog in lieu of posting about you on my blog. Large graphic, (which I will make for you) to use in the rotating banner spot you see on my Cloth Diaper Geek Blog. Approximate size is 500×300. Graphic and text will promote whatever you like and can be changed as desired through the end of the year. 125×125 ad space on both my blogs Cloth Diaper Geek and She Thinks Mom through the end of the year. If you do not have a graphic to use I will make one for you. Shoutouts via FaceBook and Twitter, throughout each month, linking to your FaceBook Page or Twitter Acct. 1 post per month (which I will write unless you want to provide it to me) on my blog (www.clothdiapergeek.com) about anything you like. Posts could promote a specific sale, your store in general, a giveaway, etc. These posts will also be cross promoted on my FaceBook Page and Twitter. If you prefer I could contribute 1 post per month to you for use on your blog in lieu of posting about you on my blog. 125×125 ad space on my blog through the end of the year. If you do not have a graphic to use I will make one for you. Twitter shoutouts, 3-4 per month, referring customers with a link to your store. 125×125 as space on my Cloth Diaper Geek Blog through the end of the year. If you do not have a graphic to use I will make one for you. Want to snag one of these sponsor opportunities? Contact me! In this post I’d like to discuss how to be successful at attracting sponsors to your blog. I’ve been a sponsor and in many ways, through my clients, I still work with bloggers and sponsor giveaways, reviews and more. I know if you’re a new blogger or just wanting to get into the market of hosting reviews/giveaways on your blog it can seem like daunting work trying to get a sponsor. You send numerous emails and you probably get very few responses, even just to say no. What you need to remember is that sposnors/retailers/manufacturers get tons of emails a week requesting to do a giveaway or review. If I had to guess I’d estimate 20-30 emails a week and that’s being conservative, for the really popular brands/stores it’s probably much more. So you have a lot of other bloggers to compete with. This means that the sponsors have to be super selective and try to determine which blogs would be more beneficial. Number #1, how was your email to them written? Make it as personal as possible. I can’t tell you how many times I’ve gotten an email and it’s obviously generic, the blogger even forgot to change my sites name or product name out with the last person they sent the email to. If you make it past number one…They check out how many blog followers you have. Which means you need to make sure that information can be found on your blog or you need to include it in your emails. They look at your FaceBook Page if you have one and see if you promote your giveaways there, how many fans you have, etc. They look at your blogs content besides just giveaways and sales announcements. Remember they want to know that people trust your opinion and will read your reviews, possibly even click through and buy their product because you recommended it. No quality content means that your followers might not actually be reading your posts and might just be there for the free stuff. They check out your design. It’s not just all about who has a nicer design but a nice presentation for their product or store is important. They look at your past giveaways and reviews. Did you thoroughly review products or just post a couple sentences and get on with the giveaway. Did you include your own personal photos of the products you review? This is very important. Or did you just grab stock photos and descriptions from the sponsors site? Did you promote the sponsors throughout the post with links and make sure that you’re sponsors are promoted in the various ways to enter the giveaways? How many entries did you get for your previous giveaways? If a blogger has a thousand followers but their giveaways are only yielding 50-100 entries then something is wrong. Either it wasn’t promoted properly or was too complicated to enter. What to do if you don’t have enough experience or are a new blogger? Practice reviewing products on your blog by reviewing things you already have! It’s free and it will make your blog look good. Review a cloth diaper you already have, or your favorite laundry detergent, blender, book, etc. Take nice photos of the products you review, don’t just use generic pics you grabbed off the internet. Consider doing a video review for your blog and share it on youtube! Sponsors love this. Hold some giveaways on your own! You don’t always need someone to sponsor. If you got a Buy 1 Get 1 of your favorite lotion then write a review and host a giveaway. Get some practice under your belt and have giveaways for future sponsors to take a look at. Offer benefits to your sponsors. In addition to a giveaway, which benefits you just as much or more than it does them, offer to advertise their site on your blog free for a month when they sponsor. You don’t always need one product for yourself. Sometimes sponsors are way more inclined to sponsor your giveaway when they hear “I love your XYZ product and will be reviewing it, I was wondering if you’d like to sponsor a giveaway?” Keep in mind that having a giveaway gets you new followers and often the manufacturer or store promotes YOU on their FaceBook Page, Blog or Website. Take one for the team! To get some experience under your belt consider skipping the part where you ask for something for yourself. Be creative! There has been quite a boom in the review/giveaway business. You need to find ways to set yourself apart from the rest and make sponsors stand up and take notice of what you have to offer them that others don’t. So that’s it in a nutshell. A quick rundown of what I think works and where I think a lot of bloggers go wrong. I’d love to know what you think of this post. Please share your comments here and also become a Fan of SheThinksMedia on FaceBook!